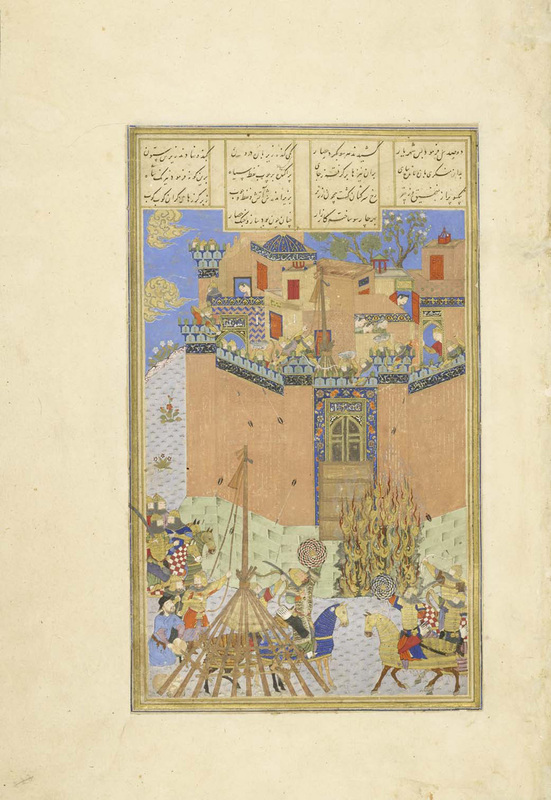 This miniature shows the Iranian army attacking the fortress of Gang Dizh, where King Afrasiyab and the Turanian army have taken refuge. The Iranians are led by king Kay Khusrau as well as Rustam (seen in the foreground with a wicker shield, wearing his tiger-skin coat), Gustaham, and other warriors. At the king’s bidding, the Iranians have dug a trench around the fortress and filled it with naphtha, a flammable substance. In this painting, the naphtha is burning fiercely while the figures on the ground load a large catapult. The Turanians vainly attempt to fend off the attack by hurling rocks down from the battlements. The crowned figure looking out of the fortress doorway in the upper right of the composition most likely represents the king of Turan, Afrasiyab.